If you are not living under a rock, you’re probably aware that this recent weekend was the first of the closed beta events for pre-purchase customers of Guild Wars 2. I didn’t pre-purchase but was the lucky recipient of a beta key anyhow. As we’ve established you are not living under a rock, you might also be aware that Guild Wars 2 is striving to break the shackles of your typical theme park MMO à la WoW or SWTOR and instead promises a more open, innovative experience. As this weekend is not bound by NDA, I would like to share my impressions with you. But there are so many things on my mind that I decided to turn it into a 3 part series. The first part you are currently reading, about my experience with the new quest mechanics that GW2 introduces. So what’s gameplay actually like? I have to admit it took me a while to wrap my head around it. It takes time to sort it out when you are used to a very established way of playing MMOs by moving from quest hub to quest hub. Once you are tossed out into the world after the level 1 tutorial you end up just outside your race’s capital with an enormous starter zone ready for exploration. The only pointer you are getting is to talk to a scout. 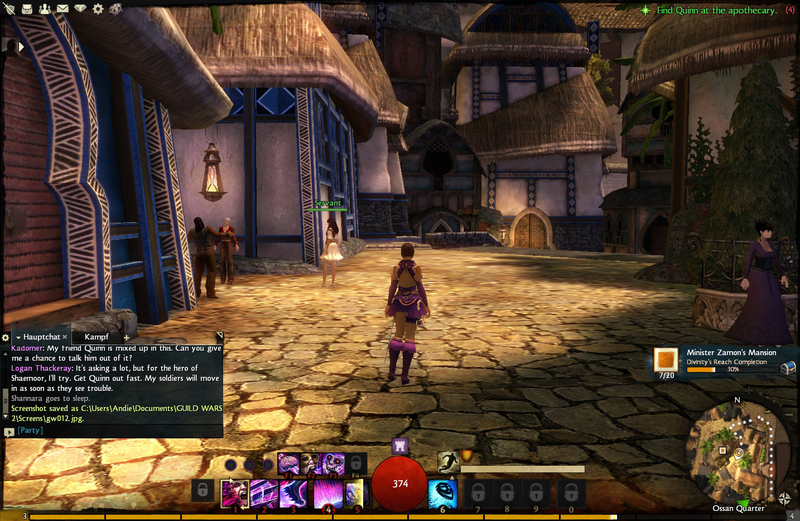 Scouts in Guild Wars 2 serve an important function. When you talk to them, they will show a certain part of the zone map, and will point you to all Heart Quests in the immediate area. I was a bit slow when taking this screenshot, because it already fogged up the unvisited area again, and no longer shows the explanations for the heart quests. If I moused over the empty hearts, I would get an explanation and more importantly the level of said Heart Quest. Unfilled hearts are Heart Quests you have not yet completed. You can only ever complete them once. The map is pleasantly reminiscent of Google Earth. I really enjoy it a lot. As soon as you approach the area with the heart, it will pop up in your quest tracker, describing the tasks you can do to help the questgiver. You don’t actually have to talk to them, but you can, if you need clarification on what to do. The Queensdale Heart Quests are all fairly rural and let’s face it, kinda boring. The very first heart takes you to a farm where you have the option of watering plants, feeding cows or flattening worm mounds, which inevitably leads to a pissed off worm trying to eat your face. You do all these actions until your progress bar for the quest has filled out to 100% and you are done. You receive experience and very little money. The quest giver turns into a vendor, for a currency called karma. Too bad you don’t have karma though, huh? In order to get karma, it never hurts to actually stick around HQ places. There are a number of dynamic events that might begin any time. For example, there’s the mother of all worms looking suspiciously like snatched right out of Dune, living right underneath the farm. There’s also a bandit attack where you have to defend the hay bales of the farm from 10 waves of bandits. You can kill bandits, or extinguish the burning hay using handy buckets of water standing around. There’s a huge amount of different events, and even though I have played through the three start zones multiple times, I always managed to stumble onto events I had not seen before. Soloing events is possible, but they were clearly designed with groups in mind. As mobs are not tagged in Guild Wars 2, you can help anyone anytime, and still get credit, and that’s what the events live from. You don’t need to be in the same party, you simply need to play with each other. Most support abilities that you have affect allies in your immediate vicinity, and again, it doesn’t require a party. Of course, with the gazillion of spell and particle effects going on, good luck figuring out what stuff you should stand in for healing, or you might suddenly stand in bad like a derp. Unfortunately the group approach means that almost every single massive event I have participated in turned into a giant, laggy zergfest. Kinda like Rifts back in the day. I don’t know if it’s different in 5-man dungeons, but if you are looking for tactical, strategic fights in events, you’re not in the right place. 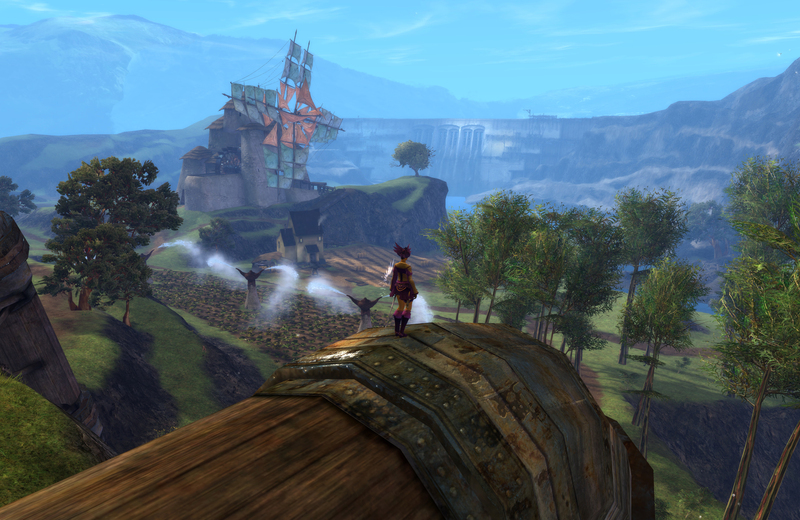 Deeper into Queensdale’s first area, you will come to an apple orchard that actually had the first chaining event that I noticed. The orchard is overrun with spiders, and in one of the dynamic events you have to take out every single spider in the orchard. Once you have done that, a spider boss will spawn, and need a group to take her down in a second event. For each event you will receive experience, money and karma points. This is where the karma vendors come in handy again because that’s how you will get the majority of gear upgrades. As you won’t do traditional quests, you are reliant on karma rewards and drops. The only quests that offer immediate rewards are the personal storyline quests. As soon as you have completed your first HQ, you will receive a mail that will start your personal storyline quests. This weekend I played a street rat human mesmer, so her best friend Quinn asked her to come see him in their home quarter in Divinity’s Reach, the capital. Storyline quests are instanced and just about always difficult. It really makes no sense to even bother trying them if you are underneath the recommended level. Every single street rat story quest involved me going against huge numbers of bandits. The story quests follow a pattern. The first one is level 3, then level 4, and from that point on every even level. This means from the point of view of experience flow, you should do HQs and events inbetween story quests to advance. Once you have done all HQs in an area, it’s time to find the next scout on the map (they’re clearly marked) and move on. I found the flow from one scout area to the next fairly nice. You can also hunt for Points of Interest on the map, or skill challenges. Those usually involve fighting a veteran mob, but there are also challenges that are jumping puzzles. I wish more of them were puzzles. They reward you with an extra skill point so you can buy more abilities for your hotbar keys 7-9. Exploration is a huge deal. In order to explore a zone 100%, you need to complete all HQs, find all fast travel waypoints, solve all skill challenges and find all Points of Interest. For 100% map completion, you actually get a reward. Not that I have ever seen what it is, because I usually fail at finding Points of Interest, and generally have struggled with skill challenges. In this beta weekend, I spent a good deal of time exploring Divinity’s Reach. I got 100% map completion there, but there’s no reward because there aren’t even any skill challenges there. Just very pretty sights. It satisfies the same exploration itch that I had in Rift when it came to locating artifacts. It’s fun. It’s a HUGE world out there, feels a lot more vast than any zone in WoW ever, and it doesn’t hurt that it’s a very pretty game, IMHO. I don’t have a great computer at all, yet I still manage to find the game very pretty. I took a couple high-res screenshots. Queensdale, lovechild of Elwynn Forest and Westfall. 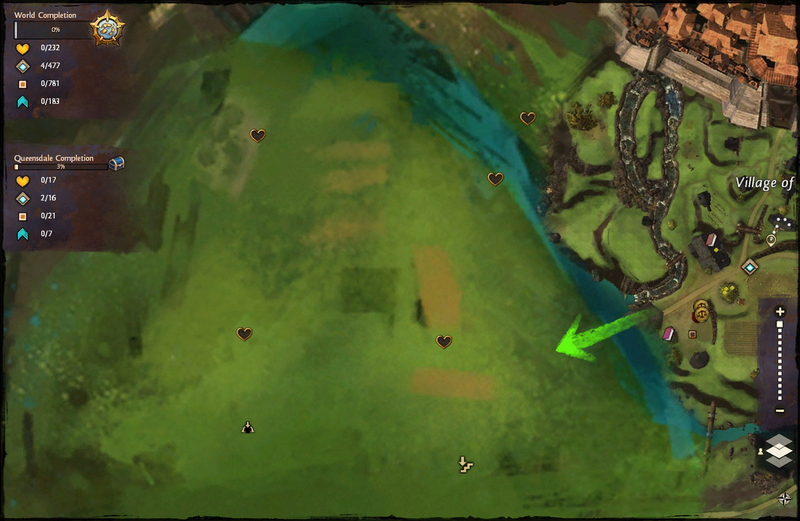 I have a feeling humans will be a very popular race in GW2, and it might be an homage to WoW that the first zone Queensdale plays like a mix of Elwynn Forest and Westfall. There are the farms and copious amounts of masked bandits. There’s also tons of woods, wolves, bears and…centaurs. Who brought the centaurs from the Barrens? All three available start zones have a particular group as nemesis. Centaurs for humans, Sons of Svanir for norn and the charr have to battle the traitorous Flame Legion. I have no beef with the quest mechanics in Guild Wars 2. I find them fun, even though some HQs are really mindlessly trivial and not the least bit heroic. I like that there are alternative ways to complete them all. Nevertheless, the experience is not as seamless as it could be. If you are very unlucky and no dynamic events are triggering while you are in the vicinity, well then, you are screwed. HQs alone give little experience, and even though Guild Wars 2 stated that this game means the end of grinding, that’s simply not the case. Without dynamic events you have to grind, and even painfully so. Killing mobs gives very little experience as well. What might help is that you buy tools to mine and fell trees, as the experience from doing that helps. You are dependent on dynamic events to keep you afloat on the experience curve, and hanging around simply waiting for something to happen, well, that’s not fun, is it? Yesterday, I got stuck because there simply wasn’t anything going on at the HQs I was doing. I somehow managed to miss the Queen Wasp event, and there were no other events firing. That is worrisome. Once you have to start grinding, it’s no longer fun. In total, the quest mechanics are certainly different, and they require you to be proactive in your exploration of a map. 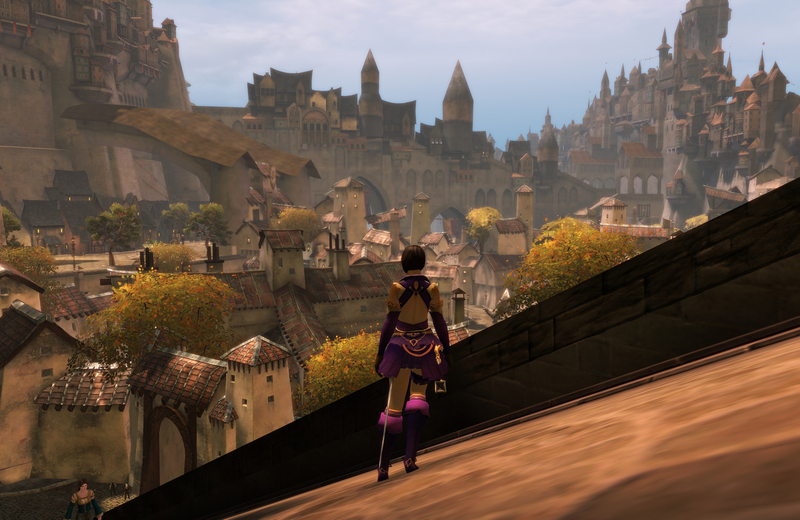 I am hopeful that ArenaNet will smoothen out the experience so that you really move on without any need for grinding. It’s not as innovative as it’s made out to be, but it will certainly entertain me quite well. In part 2 tomorrow, I will have a look at ArenaNet’s design manifesto for Guild Wars 2, and how I feel they did in reaching their goals. This might sound silly, but my biggest question is: “Does it have loading screens?”. That kind of killed Warhammer Online for me, to realize that it wasn’t one big continuous world, but a number of smaller chunks linked by loading screens. What can I say, I love exploration. There are loading screens. Whenever you enter a capital city or change zones, you will get a brief loading screen, with the name of the zone, and your exploration progress within it. The zones are huge, much bigger than WoW zones, e.g., and once you have explored the first zone, that’s only like…5% ore less of the total world exploration. 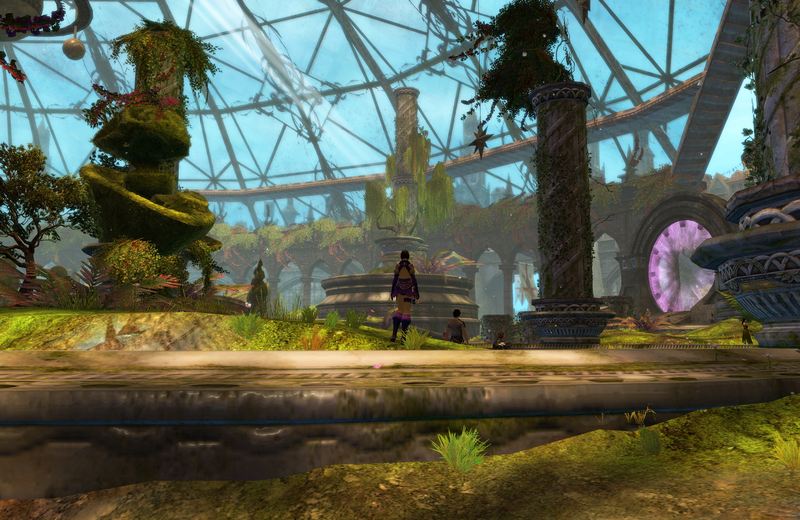 If exploring is your thing, GW2 has a lot to offer. Also, there are no mounts, which means it feels a lot more immersive. However, you still get everywhere fairly quickly with waypoints. So while many players think of the renown hearts as the main area quests and the dynamic events more as the icing on the cake, it’s actually sort of the other way around from the devs’ perspective. The dynamic events are the “real deal”, and the hearts are just an incentive for players to explore various areas of the map where dynamic events take place.